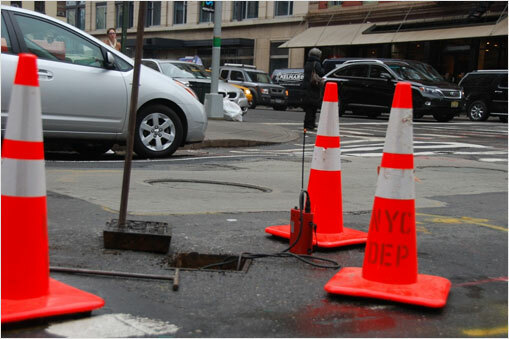 With nearly 7,000 miles of sub-surface water main infrastructure serving more than 8 million people throughout the five boroughs, DEP recognizes the importance of ensuring that our distribution infrastructure is in excellent operating condition at all times. Building upon the success of the Universal Metering Program, DEP has enhanced its commitment to monitoring water usage and detecting inefficiencies in its system by expanding its existing leak detection efforts. For over 40 years, DEP’s Leak Detection Unit has investigated leaks throughout the city’s water distribution system in order to prevent property damage, water loss and infrastructure failure. Leak detection improves overall system efficiency, which can translate to significant water savings benefitting citywide conservation and demand management efforts. Over the past five years, DEP leak detection crews have surveyed more than 3,750 miles of water mains. DEP has achieved an average estimated savings of 1.89 million gallons per day from repairing the leaks discovered during these surveys. DEP has also developed a Leak Notification Program to proactively alert customers to potential water leaks on their property. All residential DEP customers with Automated Meter Reading devices are eligible for the Leak Notification Program, and to date, over 290,000 customers have signed up for leak alerts. Working together with our customers to effectively manage our water distribution system is fundamental to DEP’s comprehensive approach to demand management. By making it easier for our customers to discover and repair leaks, we all benefit from fewer leaks, more water savings, and a more efficient distribution system. As part of the Water Demand Management Plan, DEP will continue to optimize metering and automated metering infrastructure networks which serve 836,000 customer accounts. DEP will continue to replace old and faulty meters with new, more efficient and durable meter models and optimize pressure management to prevent drastic fluctuations in pressure zones that can cause water mains to leak or break. Since the release of the 2013 Water Demand Management Plan, DEP has performed thousands of preventative maintenance inspections, and overhauled numerous pressure regulators, in an effort to optimize pressure management.